Adults on the autism spectrum are as individual as we all are. Yes, there are characteristics that have led to a diagnosis of autism, but there are still many stereotypes about what an adult with autism 'looks like' and what sorts of ways they can participate in society. The predominant stereotype is that individuals on the spectrum are tech-savvy and excel in math and sciences. Although we have some individuals who 'fit' this stereotype, there are many others who are not oriented towards the sciences, but rather are creative and enjoy drawing, music, theater, and dance. While others have not found their niche and are wondering why they don't seem to have a 'special' talent. Often, these individuals struggle with social anxiety and they may have low self-confidence and low-self esteem after trying to 'fit-in' to traditional approaches that have not worked for them. Individuals with autism deserve a chance to contribute to society in a way that suits their personal and particular styles and meets their needs, but this requires a team of creative and innovative professionals to bring strategic approaches to this unique population; including breaking through traditional barriers to develop new opportunities for these adults. How Does The Reactor Room Program Work? The Reactor Room is a ’call-to-action‘ and it was borne of the vision and mission of Spectrum Fusion. The purpose of the Reactor Room is to improve the possibilities for adults with autism, and their families, by generating novel solutions for adults on the autism spectrum who may be ’stuck‘ in their current situations and unable to use their skills, interests, or strengths to their full potential. Life-changing ideas are the result of brainstorming and collaboration powered by teams of bold and innovative individuals from all walks of life. We bring the best that Houston has to offer, for the brightest future for adults on the autism spectrum. We are a team of business experts, entrepreneurs, community connectors, therapists, and health care professionals. These individuals may require unique strategies to sort through the complexities of adult life, and explore pathways to achieve meaningful progress in their lives. Positive outcomes of the Reactor Room include experiences for these individuals to gain exposure in their areas of interests or strengths by shadowing a professional in their desired career, access to business and marketing experts for product development, employment opportunities and scaffolding for business proposals, and volunteer experiences. Through the Reactor Room, we reach out to everyday people, employers and organizations across Houston to provide ways for adults on the spectrum to connect to the community. We call this an 'activator'. Together, we are generating brilliant ideas for life-changing possibilities. Sometimes people without autism might not know what they can do to make a difference in the lives of people with autism. The first step is to have an open mind and heart, and be ready for your world to change. We are as excited as you are to meet our members. Dr. Katherine Loveland has a wealth of knowledge and years of experience as Professor in the Department of Psychiatry and Behavioral Sciences at McGovern Medical School at The University of Texas Health Science Center at Houston (UTHealth). Dr. Loveland runs her C.L.A.S.S. (Changing Lives through Autism Spectrum Services) that has been a lifeline to so many adults on the autism spectrum in Houston. Colleen Russo, Executive Director, at The HUB Houston, has dedicated her career to educating individuals on the autism spectrum. Colleen is a treasure to so many families in the Houston area, and they rely on her, not only for her expertise, but for her love, guidance, and support. The HUB is an organization that fosters belonging and community. The HUB's programs are many, but their strengths include links to employment, and unique and interesting social outings for their members (they even take trips together to exotic places like Wisconsin) The HUB is doing important work for the families that they serve. Colleen is always thinking of ways that her 'HUBsters' can connect and engage with the community, and we look forward to learning more about her exciting ideas that make a difference to so many families. Colleen is a member of The Reactor Room team. LongTale Publishing, founded in 2007, produces works in the categories of juvenile fiction. LT Press is an adult imprint of LongTale Publishing. LongTale uses a hybrid publishing model, giving the author more control of their work and ownership of their copyright, while following a traditional standard of publishing. We do not act as an investor in the projects. Former division head of training for one of North America’s top ten language service companies, Ryan Foley regularly presents as an expert in verbal and nonverbal communication, deception detection, and public speaking nationally, and contributes analysis on presidential debates on Fox 26 News Houston. Ryan is currently a mentor with the entrepreneurship program at the Wolf Center at the University of Houston. We are looking forward to input from Ryan and future entrepreneurs. Creating success for children and young adults with disabilities by empowering their families as they navigate the complex education, health care & social service systems! By providing information on the various systems, referrals to community resources, training events on various disability topics in the office, community and at our annual conference, a website devoted to providing accurate & consistent information on the special education process, a Guided Transition program, as well as a Leadership & Advocacy training program; families and individuals with disabilities have an opportunity to network and learn from one another. By working together, we can create communities where ALL children belong and excel. Family to Family Network believes that ALL children should be included and supported in our schools and community in order to ensure the future success of children with disabilities. Brothers and sisters (Sibs) of individuals with special needs have the longest relationship of anyone in the lives of their sibling. We believe that Sibs have much to offer one another in way of guidance, encouragement, and support if given the opportunity. As the Texas chapter of The National Sibling Leadership Network our vision is for brothers and sisters of siblings with special needs to share lived experiences, access information, and advocate collectively for and with their sibling. We are committed to providing resources and support to siblings in person and online. We are hoping to expand across our beautiful state! If you are interested in joining TXSLN please send us a message. 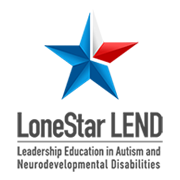 LoneStar LEND is a training program that was designed to develop leaders in the field of Autism Spectrum Disorder and other Neurodevelopmental Disabilities (ASD/DD) through an interdisciplinary training model focusing on leadership, cultural competence, and evidence-based practice. The purpose of this program is train leaders who will improve global service delivery and increase early identification and subsequent diagnosis of ASD/DD to children across the state of Texas. The LoneStar LEND mission particularly promotes underrepresented and underserved children across Texas, teaching cultural and linguistic competency, and family-centered care in an interdisciplinary model to produce future leaders equipped to best serve children with ASD/DD. The mission of the Program in Communication Sciences and Disorders at the University of Houston is to advance the understanding of typical and disordered speech, language, swallowing, and hearing through excellence in teaching, scholarship and service to the community. The Menninger Clinic affiliated with Baylor College of Medicine and The Methodist Hospital (now Houston Methodist) in Houston in the spring of 2003. The clinic relocated from Topeka, Kansas, to Houston in June 2003. When C.F. Menninger and his sons, Dr. Karl and Dr. Will, founded this organization in 1925, they envisioned "a better kind of medicine for a better kind of world." Menninger's affiliation with Baylor College of Medicine and Houston Methodist ensures that Menninger will continue to fulfill its core mission of providing patient care, training future clinicians, and conducting innovative research.